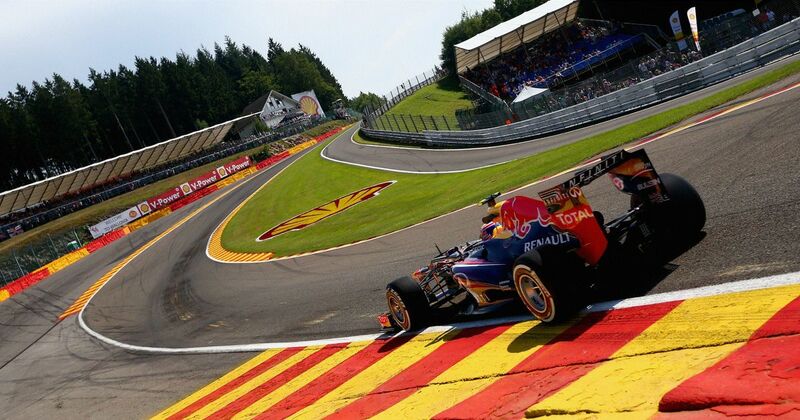 Few corner sequences are as thrilling, spectacular and special as Eau Rouge/Raidillon. There’s nothing like it in motorsport, that’s for sure. Over the years, it has evolved and changed alongside F1, but the section of track hasn’t lost its charm, character and challenge. So, what better way to beat the summer break blues and get excited for this weekend’s F1 return than with a load of awesome gifs of cars flying up the famous hill. You can barely make out when the GIF ends and the next loop begins! This GIF perfectly proves the incredibly speeds F1 drivers are going as they fly through Eau Rouge. These kind of camera angles always look better in slow motion! Few drivers can pull off an overtake at Eau Rouge but Kimi Raikkonen managed it, putting in this amazing pass on Michael Schumacher. Getting it wrong through Eau Rouge and Raidillon doesn’t usually end very well, but somehow Daniel Ricciardo managed to save this one in amazing style. Throwing it back a few decades to some vintage Eau Rouge. The barriers on the inside are so much closer to the track! TURN AROUND! Look at what you’re missing out on!